Suited to most styles of greenhouse structure and roof vents including:- saw-tooth vents, single roof vent or twin independent gull-wing vents. Works tirelessly to maintain the set temperature. Vents are nudged open and closed (nudge size settable). Vents close quicker than they open. Auto-purge sequence available to reduce chance of excessive humidity when vents are closed. The Autovent 1 uses a temperature sensor with simple rain and high wind sensor overrides to provide a low cost automatic venting system. Two temperature set points are used, one for the roof vents and the other for the side walls. Manual override switches and LED indicators on the front panel give good user information and the ability to manually take over the control at any time. AutoPurge On/Off - When the vents are all fully closed, this setting opens the main vents by one nudge every 15 minutes and then immediately closes them. This is normally sufficient to exhaust the stale humid air. This helps reduce fungal disease problems which can occur if the greenhouse is closed for long periods. This action will be overridden by high wind and rain (if enabled). They then operate to maintain the inside temperature as follows: If the temperature is more than 0.5 deg C above the set point(s) then the vents will nudge open. After a delay time of 3 minute if the temperature is more than 0.5 deg C above the set point then the vents will nudge open again. Alternatively, after the delay time of 1 minute, if the temperature is lower than 0.5 deg C below the setpoint then the vents will nudge closed. Although the controller tries to keep track of the vent positions (by monitoring the timings of the automatic operations) it is possible for the calculated position to creep out and for incorrect operation to result. This is especially the case when manual operation has been used as the controller does not monitor this. To avoid this potential problem, the vents will continue to try to nudge closed even when they are fully closed if the temperature is low or to nudge open when fully open if the temperature is high. This will happen every 15 minutes. This is a safety feature. On rain detected, one vent or both vents, if selected, will close for 10 min's. If single vent closure is selected the vent to close will be the last vent to experience strong wind. Suits most types of vented roof and/or side vented greenhouse. Heating – proportional or ON/OFF. 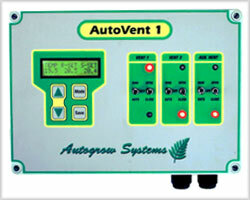 Advanced algorithm for venting and heating to give good control of temperature and humidity. Fogging control - pulsed Stirring fan control. Exhaust fan control (variable speed or ON/OFF). Four time zones to allow detailed profiling of environment. Optional PC interface with remote setting, data logging, event logs etc. The AutoVent 2 can control the roof and side vents on most types of greenhouse including gull-wing, saw-tooth and side vented. The venting algorithm will try to control both temperature AND relative humidity. If heating is available then this too will be used to try to control humidity in addition to temperature. The roof venting uses an intelligent algorithm to adjust the nudge size taking into account present roof position, size of error, rate of error change, differential temperature (inside – outside) and wind effect. Air heating can be by either proportional control or ON/OFF control. Proportional control is normally used in conjunction with a boiler heating water pipes. This provides a very gentle heat and the heating pipes can be positioned either under the grow beds or between the rows of plants. In this way less heat need be supplied as compared with general warm-air heating. Water pipe heating is gentle, economical and avoids sudden drying of the air. Proportional control uses a 0 to 10 Volt signal to control the position of a three-way valve. The heating is used to control both the temperature and the relative humidity. TFogging may be used to assist with cooling or to increase humidity in dry weather. Two outputs are used; one that comes on constantly for the duration of three short pulses of fog. The outputs then turn off for five minutes to allow the fog to vaporize. A single stage of stirring is provided. This is normally set to come on whenever the vents are closed, when humidity is excessive or when fogging. It may be set to turn off during fogging. Shading is available only in houses having less than two side wall vents. It operates to maintain the light level below a user set maximum. If the maximum light level is exceeded it will start to close immediately but once closed requires the light to remain below the setpoint for at least the time specified by the user. In the event of very high humidity, the controller can be programmed to go into a purging mode. In this mode it increases the heating temperature by a few degrees (user set) to try to dry the air. Eventually the humidity will creep up again due to plant transpiration and the controller will nudge open the vents (or if no vents it will switch on an exhaust fan) for a few seconds (user set) to exhaust the warm humid air. Then the vents will close and the heater will again warm and dry the fresh air. This purging cycle will continue until the humidity is brought under control.In addition, a timed purge may be set to crack the vents periodically. Again all aspects can be set by the user including the time zones during which this feature will be active. CO2 is measured and injected providing 1) there is sufficient light, 2) the vents are closed or 3) the vents are below a set limit. The user may specify any desired level of CO2 from 0 to 2000ppm and the system will try to provide this when the above conditions are satisfied. The optional PC interface allows the settings to be viewed and set from the user-friendly Compugrow software. It also facilitates the collection of measured data and events from the controller for logging to the hard drive whence it may be displayed graphically for ease of interpretation. The computer interface also allows for alarms to sound at the PC (via the PC sound card) or even be auto-dialled out to a telephone or pager (via the PC MODEM). "State of the Art Control For Hi-Tech Greenhouses"
Suits most types of roof and/or side vented greenhouse. Automatic switch over from passive venting to fan/pad. Fogging control for cooling or humidity control - pulsed. 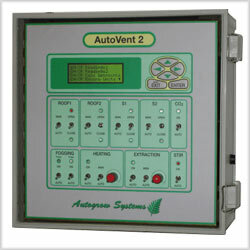 Advanced algorithm for venting and heating to give good control of temperature and humidity including purging sequences. Two stage stirring fan control. Two levels of shading with inside/outside selection. Supplemental lighting control – two levels. Thermal blanket or blackout photoperiod control. Single weather station for multiple AutoVent3 controllers. PC interface with remote setting, data logging, event logs etc. The AV3 can operate with any mixture of vents and fan/pad evaporative cooling. If both are available it will start cooling by operating the vents but if this is unsuccessful in reducing the temperature, the vents will close and the fan/pad will start. If only fan/pad is provided then cooling will start with single stage fan exhaust and if this is unsuccessful in controlling the temperature it will add stages and/or pad one at a time. If the temperature remains above the set-point when all stages and the pad are operating, then shading will be applied to try to assist. The venting algorithm will try to control both temperature AND relative humidity. If heating is available then this too will be used to try to control humidity in addition to temperature. Any combination of vents can be controlled including twin independent roof (gull wing), saw tooth, single or twin side walls. The roof venting uses an intelligent algorithm to adjust the nudge size taking into account present roof position, size of error, rate of error change, differential temperature (inside - outside) and wind effect. The 3 stage fans come on in sequence and the pad is normally added between the first and second stages unless the humidity is very high (settable) in which case it will activate between the second and third stage unless extremely high when it activates only after the third stage fan has come on. Air heating can be by either proportional control or ON/OFF control. Proportional control is normally used in conjunction with a boiler heating water pipes. This provides a very gentle heat and the heating pipes can be positioned either under the grow beds or between the rows of plants. In this way less heat need be supplied as compared with general warm-air heating. Water pipe heating is gentle, economical and avoids sudden drying of the air. The heating is used to control both the temperature and the relative humidity. Fogging may be used instead of fan/pad to assist with cooling. The fogging may also be used to increase humidity in dry weather. Two outputs are used; one that comes on constantly while fogging is called for and another that pulses on for short periods to inject puffs of fog. Two stages of stirring is provided. The first stage will always be on when the vents are closed and exhaust fans are stopped. The second stage will also come on when the temperature or humidity is high. Both fans may be set to come on when fogging is active. In the event of very high humidity, the controller can be programmed to go into a purging mode. In this mode it increases the heating temperature by a few degrees (user set) to try to dry the air. Eventually the humidity will creep up again due to plant transpiration and the controller will nudge open the vents (or if no vents or in fan mode will switch on an exhaust fan) for a few seconds (user set) to exhaust the warm humid air. Then the vents will close (or fans turn off) and the heater will again warm and dry the fresh air. This purging cycle will continue until the humidity is brought under control. Two stages of shading and one thermal blanket or blackout screen control are provided. The shades may be designated as inside or outside. If outside then they are withdrawn in the event of strong wind or rain. Normally they operate as follows:-At a set time each morning or if the light exceeds a user set level screen 1 will close. If the light exceeds a second user set level then shade two will close and when closed shade 1 will open. If the light exceeds a third user set level then both shades will close. Screens will close after the light level exceeds the set point for 1 minute but will only reopen when the light is below the setpoint for 15 minutes. The thermal blanket closes at a set time each evening. If roof vented then this is on provision that the temperature and humidity are within limits. The thermal screen opens when the temperature exceeds the day-time venting temperature. If temperature or humidity become excessive and if the house is roof vented then the thermal screen will crack to 15% open. This will happen before venting or purging is initiated. Alternatively, the thermal blanket output may be used for blackout cloth applications for photoperiod manipulation. CO2 is measured and injected to achieve a user set point providing 1) there is sufficient light AND 2) the venting is below a user-set limit. The user may specify any desired level of CO2 from 0 to 2000ppm and the system will try to provide this when the above conditions are satisfied. Two stages of supplemental lighting are available and can be used to extend the hours of daylight for photoperiod manipulation or else to top-up the available sun light to achieve a set integrated value for the day. This may be achieved by setting them to come on when the day light falls below a certain level and then also switching them on during hours of darkness to achieve a set daily integrated value.